Social medias are the base of virtual world. It is estimated that more than 30% of people use internet for the sake of utilizing social media. Hence, we can analyze the critical importance of social media on the internet. If we look back in time, we can see the variation of social media now and then ! With the passage of time, social medias became much powerful, secured, advanced as well as reliable. The path and the agents involved in social media development seems to be much vast and the principles used sounds amazing ! One of such pioneer factors is AOL Instant Messenger. AIM (AOL Instant Messenger) was an instant messaging computer program which enabled users to communicate in real time. It was popular back then, in 1990s to Mid 2000s, and is considered to be the pioneer stuff of social media development. 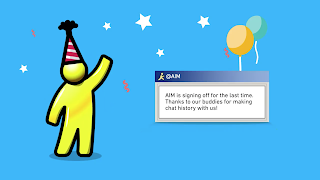 With the evolution of time and development of social media, and popularity of Facebook and Twitter made AIM to fade away, which made it's owner Oath Inc. to permanently shut down AIM service from Dec 15, 2017, stated on October 5, 2017! It's such an unhappy moment for adults, who grew up using AIM to say goodbye to something which enlightened their past. AIM was the one of the best instant messaging program to communicate with others. It was the pivotal part of introduction to life on the internet for most of the people. It helped people understand the internet communication carefully and emotionally in a way that people could understand the vast pace of internet growth and it's importance in the future. AIM wasn’t the first instant messaging tool to exist, but it was the most widely used and influential in broad strokes, making it possible for us to feel at home in lots of different online settings. And the ability to chat one on one, or in a group. AIM never stood a chance at keeping up with the pace of innovation on the web, which is why it has left, but that doesn’t change what it meant to us. AIM truly set the parameters for most of our virtual interactions, so when it goes dark on Friday, it will be gone but certainly not forgotten ! Many blog lacks traffic that there content desires. Creating blog is easy but its hard to get organic traffic and visitors. Lets talk of Blogger Smasher. For first three month my blog hardly got less than 200 visitor daily but see my blog popularity has grown that my blog get more than 500 unique page views. Lets learn some key point to increase traffic ! Every body likes the exclusive content. Your content must target what your Visitor want. You need to publish only genuine content which can make audience happy that surely increase your page view. It's generally good to publish about 3 articles in a week and a unique post in a month. Advertising is probably the the best way to increase traffic. For first three month it is better to advertise using Google Adwords. Just it is matter of money. After advertising you will see your blog level and cost goes high that you will never expect. For eg: if you spent $100 for your advertisement and even many of clicks are fake than also you can make profit, than also it is guaranteed that you will have your sales boosted as the same $100 comes in your hand like a boomerang with the net cost of $200 and even more. If you arise question or help other in Forum you will certainly get some Traffic. Thousands of people visit Forum then there is high possibility of Getting more Traffic. For Blogger it is better to participate in Blogger Help forum. If you reduce your Blog size then people will probably stay longer. A Blog that loads faster touch the heart of Visitor. Generally people recommend your site as valid if your site loads faster and they will be as referrals delivering you large amount of traffic. Blog Blogger Smasher gets 70% of traffic form Search Engines. From this you can know the eseentiality of SEO. To make SEO Friendly you must use alternate tags in image. You must also use nofollow, Titles etc. to your Link. Adding Meta tags helps in contribution of SEO. Social Media helps to diversify your content. If you want to increase traffic social media has got high role. Blogging Sentral Gets 15% Traffic from Social media like Facebook, Google plus. To promote social media you need to make Facebook, Google + fanpages and upgrade and share your articles in them. At first we need to identify the Traffic Source of Blog. Blogger Stat is not effective so use Google Analytic and Stat Counter. You can get detailed information of your current traffic and use those traffic bases as a technique to boost your traffic. Adding Image and video helps to increase SEO in Google image and Google video and YouTube. Thus You can create may traffic source from it. Needless to say, youtube and google videos can instantly send you thousands of traffic. If you Post your Content Regularly 2-3 times in a day your visitor will stay longer with your Blog. This surely increase your Blog Traffic. It may not be possible for some bloggers, but I request them to post a content in a day. Ping the Blog using ping-o-matic. Don’t use it beyond limit other wise you will get banned from search engine. You can use window live writer for pinging too. I am sure that these tips would help you. If you know other tips also then you can comment below? We are waiting for your comments!! We have seen different social media widgets in most of the blogs. A blog without social media is an incomplete blog. For making a blog complete and more advanced, social media is highly required. So, in this post, we will be discussing on adding social media widget for blogger. 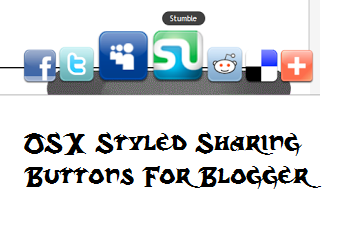 In this post, we will be discussing on Adding OS X Styled Sharing Widget For blogger. Have you ever used MAC OS X. If you have used, you may find a Desk Like Thing where all apps are placed and when we hover on it, it starts to move. The Widget is same like that. Or you can watch the picture on the right side. All Done. If you have any problems regarding this, Comment and I Shall be Helping You. Having any queries regarding Blogger or website setup?